Today is one of those days where I’m not feeling very festive. Lucky for us, I made a recipe that will help me at least pretend like I’m in a good mood, no? I mean…this fresh from the farm silver queen Mexican Street Corn drizzled in a homemade honey buffalo butter and crumbled Gorgonzola cheese is so divine it should knock those blues right out of my brain. How could anyone stay in a bad mood when they’re stuffing this in their face? Speaking of sucking…have y’all seen the show Orange is the New Black on Netflix yet?!? The show is hi-la-ri-ous, and it revolves around a woman named Piper who suckily ends up in prison for something stupid she did many moons before. It follows her life as she deals with the shenanigans of all the lovely things a women’s prison has to offer. I totes can’t think about corn ever again without thinking about Big Boo pulling a couple of cold cobs and a salt shaker out of her bra while Piper is getting (wo)man-handled by Crazy Eyes during the weekly movie. I can’t blame the girl for stashing the stuff away either. It’s such a delicious and nutritious snack at any time of the day. As you’ve read all summer, Mama F has been bringing home fresh produce nearly every single weekend. One of those bags just so happened to contain 2 dozen ears of super sweet silver queen corn. In my opinion, corn of the silver queens is far superior to any other corn you can find today, and I’m pretty sure it’s available everywhere. I’ve also seen it called white or sweet corn, but if you can’t find either, yellow corn will also do. 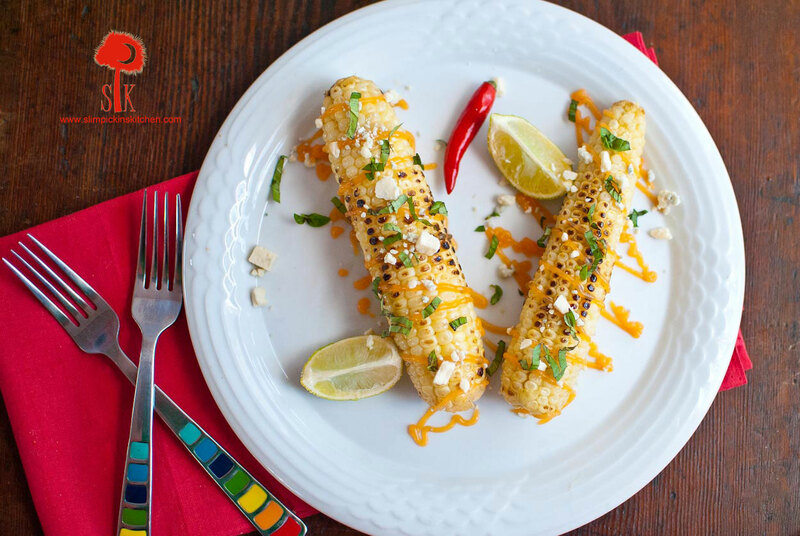 I’ve always loved Mexican Street Corn and, as soon as I saw the bag in her hands, I couldn’t wait to make my very own version for you. Since fresh corn on the cob is one of my all time favorite summertime side dishes, the 2 dozen ears did not last very long at all. That’s why I only had two cobs left to photograph when the recipe clearly makes four. Hey…the baby made me do it. What foods lift your spirits? Can you find silver queen corn in your area? Cook corn in a large pot of salted boiling water for 5-6 minutes or until kernals are tender. 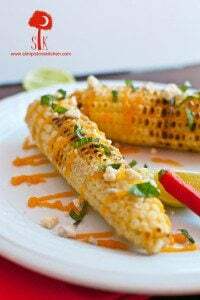 While corn is boiling, add butter, honey, and hot sauce to a microwave safe bowl and heat for 30-45 seconds or until the butter is melted. Stir together until well blended. Once slightly cooled, pour the honey butter into a small plastic sandwich bag and refrigerate until ready to use. Place a large skillet over medium-high heat and spritz with olive oil. 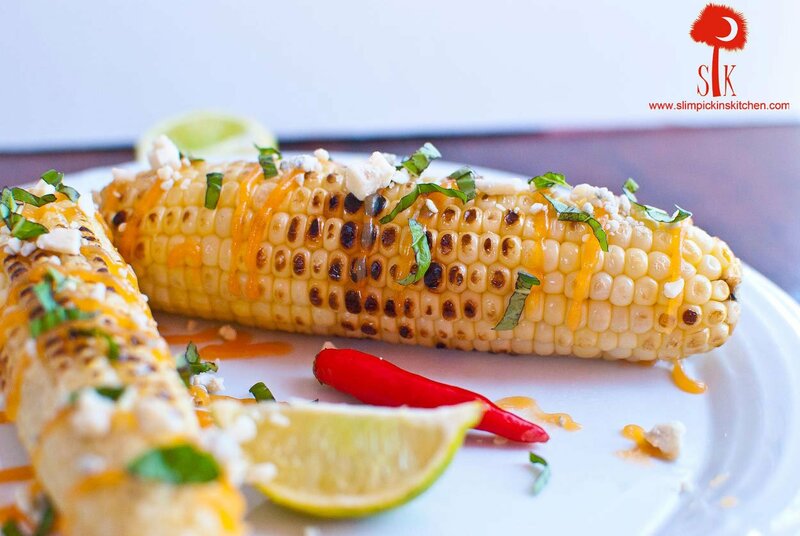 Once slightly smoking, add the cooked corn to the pan and continually turn until the corn starts to char. About 3-5 minutes. Once charred to your liking remove from heat. 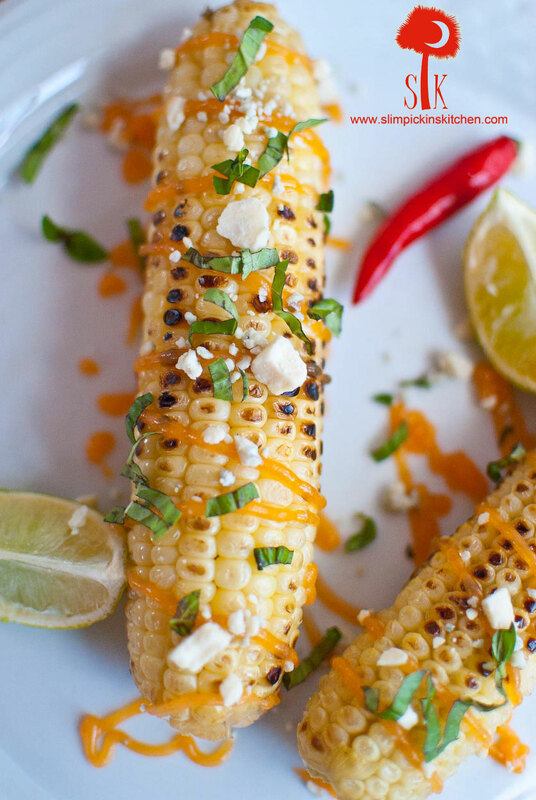 Snip off a small section of of the plastic bag and drizzle the corn with the honey butter. Spritz with fresh lime juice and sprinkle with crumbled cheese, freshly chopped herbs, and salt and pepper. Serve immediately.